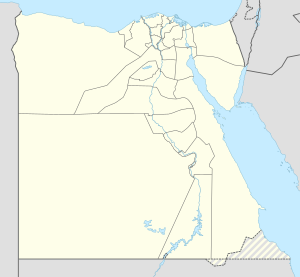 Kafr El Sheikh (Egyptian Arabic: كفر الشيخ‎ pronounced [kɑfɾ eʃˈʃeːx]) is the capital of Kafr El Sheikh Governorate, Egypt, about 134 km north of Cairo, in the Nile Delta of lower Egypt. As of November 2006, the town had a population of 147,380 inhabitants. Kafr El Sheikh was earlier known as Denqiun, and has been settled for thousands of years. In 2006 the University of Kafr El Sheikh was established. Kafr El Sheikh is responsible for more than 40% of total sea food production in Egypt. Kafr El Sheikh is located in the southern side of the Kafr El Sheikh Governorate, it is famous for agriculture, especially the production of rice. The city is surrounded to the east by the villages of Qantara and Sawalha which are separated by a small Canal. The population of the city, according to a census from the Central Agency for Public Mobilization and Statistics, is 147,393. Kafr El Sheikh, is the fourth largest city in the Nile Delta. Kafr El Sheikh is the home to various factories, including a rice mill, a poultry forage factory and a sugar beet factory. Kafr el-Sheikh is classified by Köppen-Geiger climate classification system as hot desert (BWh). ^ Central Agency for Public Mobilization and Statistics, Egypten. Accessed 11 November 2006. ^ "Climate: Kafr Al-Sheikh - Climate graph, Temperature graph, Climate table". Climate-Data.org. Retrieved 13 August 2013.